The baby boomer generation begins with those born at the end of World War II in 1945. The last of the boomer generation is a matter of opinion, but let's call it 20 years later, for those born in 1965. This generation reaches the traditional retirement age of 65 in 2010 to 2030. At that time they (OK, we) will depend on the smaller, younger generations to pay our social security, plus whatever savings we have accumulated while working. So one can envision a difficult period with a lot of older people needing support and not many of working age to do the supporting. From a stock market perspective, it doesn't look good for economic growth. But lately it has occurred to me that this timetable actually happens earlier. Income starts declining around age 55, due to early retirement, age discrimination, or out-of-date skills and perhaps declining energy. At the other end of things, by 2020 the boomer generation will be reduced in size and importance. So the bad period may actually be 2000-2020. 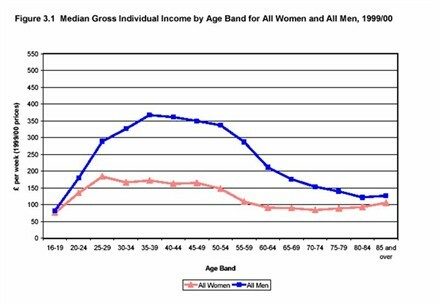 The image I have is of boomers having had their peak earning years in the 1990s, working and saving hard for retirement. This period is now fading and may at least partially explain the three year bear market. And foreshadow 17 more bad years - yikes! The bull market peak on the Dow was 11,720 in January 2000. For the S&P 500 the peak was 1,527 in March 2000. For the NASDAQ composite, it was 5,048 in March 2000. As of Friday, the Dow lies at 7,908 (off 32%), the S&P is 834 (off 45%), and the NASDAQ is 1,310 (off a whopping 74%). Certainly we're in a bear market. If you dabbled in high-flying NASDAQ stocks back in the late 90s you've probably taken a real bath. The question now is: when do we reach bottom, or is there any hope of a revival in the averages? Interest rates are low, the lowest in decades, which is good for business because it makes it easy to borrow and reduces the payment burden of debt. Fiscal policy is stimulative, i.e. the federal government is running a big deficit, which according to Keynesian theory will stimulate the economy because the government is generating all this demand. Stock prices have come down to more reasonable levels, and unemployment has risen. Thus, there is some room for higher prices and a rise in production. Prices are still high. A long-term average price-earnings ratio is 15, but the averages are at nearly 30. The momentum is down, down, down. 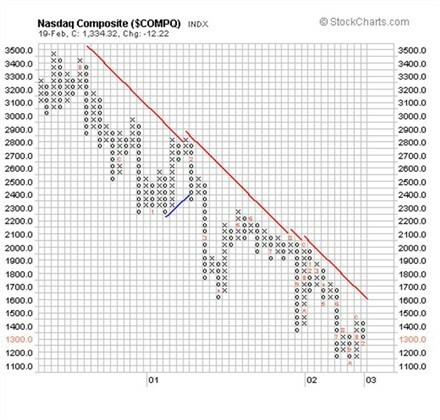 Check out the above chart of the NASDAQ composite. The mood is fearful. The market is worried about a war in Iraq. IPOs have virtually dried up. Everyone is hunkering down and waiting out the storm. So, as always, it's unclear, but there's not much sign of an end to the bear market yet. I used to post regular stock market newsletters back when the market was booming, but of course it became less fun when it turned bearish in 2000. The old letters are archived here. Now that we've had three years of down markets, I think it's time to take a new approach to these comments, and just make this a weblog that I will update whenever the spirit moves me. I've enabled comments on this blog, so feel free to post your thoughts, too.